Today it was me, my husband, and my son. Here we are just before the start. 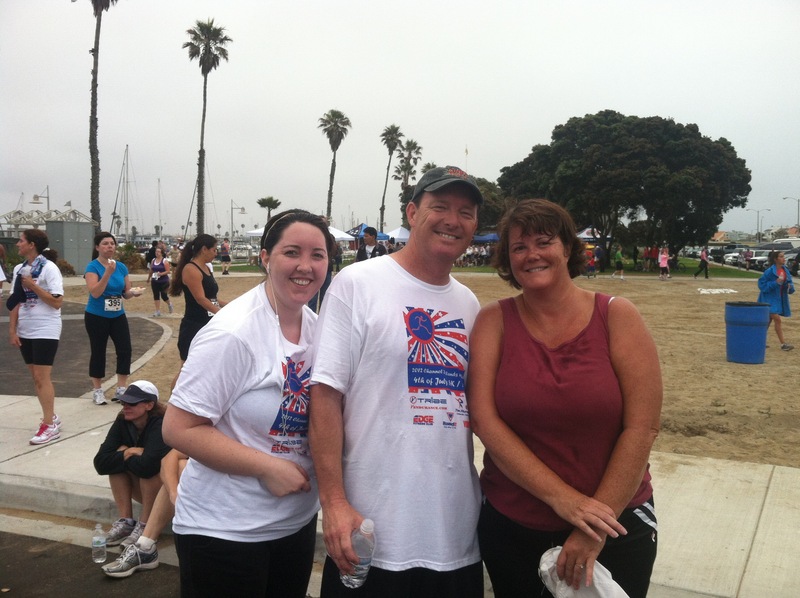 Five years ago my daughter, husband, and I ran our first 5k races at the Channel Islands Harbor 4th of July 5k and 10k. We’d started running earlier in the year. Megan and I were close together but she had a better kick and beat me at the end. She still has a better kick. We both remember our excitement at completing this first race. My time was 36:16. I’m very proud of that time because it is a marker on a new, fit way of life. We don’t do the race every year because we sometimes travel for Independence Day, so my next race was in 2015, this time a 10k. I was training for my second marathon at the time and this race was in the middle of a longer run. I was absolutely thrilled with my time of 1:04:44. I remember finding one of the coaches for the training program and excitedly showing her my time. I didn’t run this race in 2016, but ran a 10k on July 23rd in 55:22. I don’t remember the same level of excitement that day. Maybe it was because I was also running a 5k…and it was hot! But I was certainly pleased with the time. 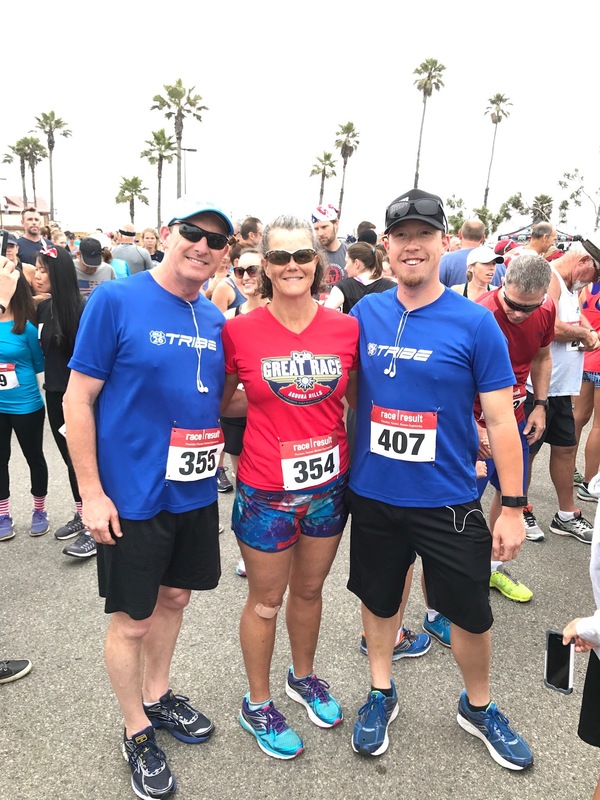 Today I ran the 10k…just my third 10k. I wasn’t sure what to expect. I just started hard running last week, after my recovery from the Mountains 2 Beach Marathon (Recap here). 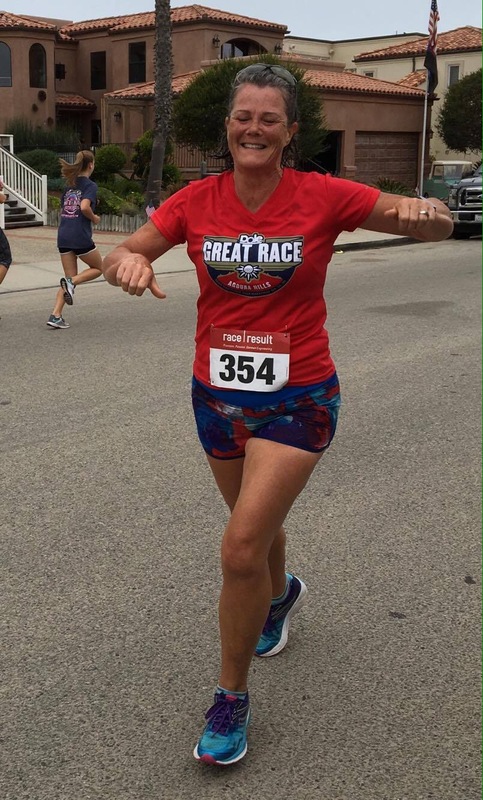 I raced a 5k last Wednesday and was disappointed with how hard it was for me…and for my time. My coach thankfully told me I should be happy that a bad day was better than my best day a year ago. Ok, I’ll take that! Then on Saturday I had a nasty fall 1 mile ito a 9 mile run. I’m still battered and bruised…and I completed the run. A friend took this photo somewhere around mile 5. I gave a thumbs up but not fast enough. My goal today was to beat my 55:22 from last year…and not crash at the end the way I do in a 5k. I started a bit conservatively, felt good after the first mile, and pushed the pace a bit. Almost every mile felt good, with miles 5-6 being the hardest (as they should be). I got a cramp in my side for part of mile 6 but then it went away. I sprinted the last .2 and finished with a time of 51:56. That’s a 3:26 PR! WhooHoo! A lesson in all this is that progress happens when you stick with it for the long haul. Another…enjoy the journey along the way. Today I’m personally thankful for: community races; all the volunteers who were out there this morning; and FREEDOM, may we not squander it.